The ArOmis Professional Aromatherapy Diffuser represents the luxury category of essential oils diffusers in both price and quality. 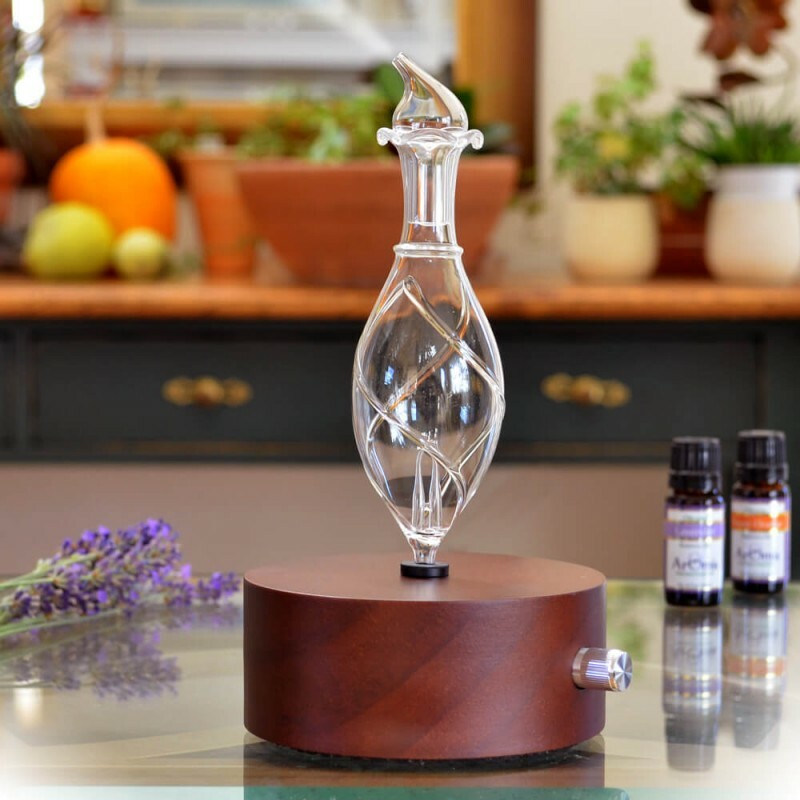 ArOmis glass and natural wood diffusers are designed for home, office and practitioner use. Heat and water free aromatherapy diffuser. Works by blasting small drops of pure essential oil with compressed air. The luxury category in the aromatherapy diffuser family in both price and quality. as home and office use. Aromatherapy Diffusers are becoming more and more popular making the choice of an effective and professional aromatherapy diffuser difficult -- at best. The ArOmis Aromatherapy Diffuser is entirely different than the run-of-the-mill diffusers and works by blasting small drops of pure essential oil(s) with compressed air. This results in a "nebula" of pure essential oil mist that flows out of the reservoir bottle and into the air. Heat-Free and Water-Free make these units among the most effective aromatherapy diffusers on the market. Beautifully designed, the unit is made of glass and sits vertically on a mahogany-stained wooden base. excellent. I get many comments about the cleanness and freshness of the air. Diffuser is at the top of my list because of it's therapeutic and professional results. Heat-Free and Water-Free. Produces a very powerful and immediate aroma effect without heat or water that can compromise high quality essential oils. Core component is made of glass which means they work very well and do not corrode when in contact with strong potentially corrosive essences. Elegant and beautiful for every type of decor. Excellent quality metal components and switches. A built in automatic timer with auto shutoff is standard on the ArOmis Aromatherapy Diffuser. 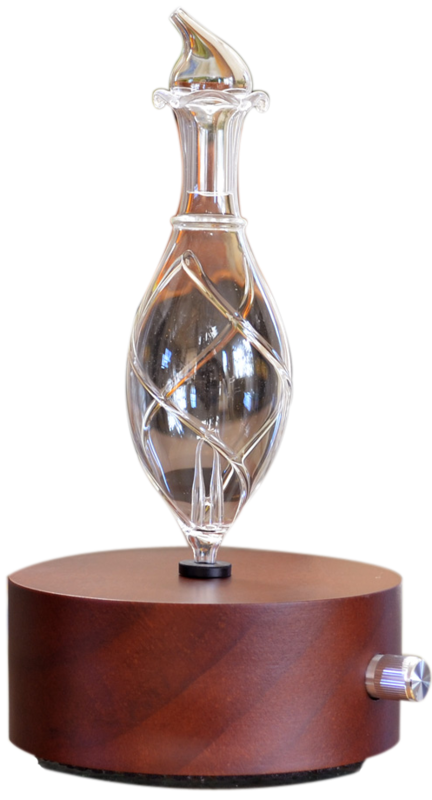 Has an elegant hand blown glass diffuser bottle and natural wood base. Extra parts are available from OAWHealth.com. ArOmix diffusers are the only choice for those serious about essential oil diffusing. 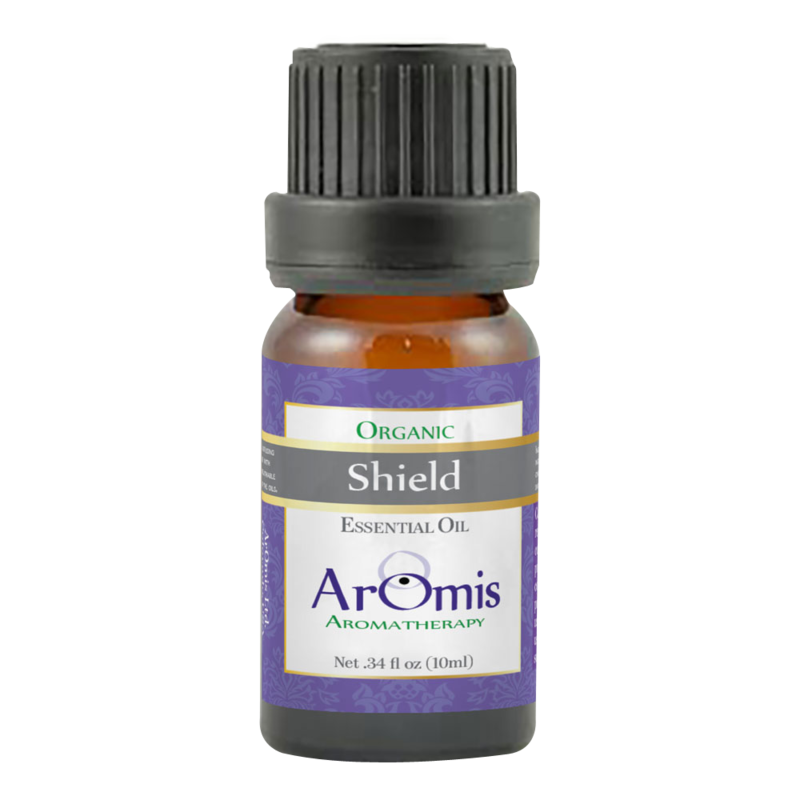 *Shield Essential Oil Blend is a derivation and improvement on the Young Living popular Theives blend. We have changed the recipe to include Cinnamon Leaf oil in place of the Cinnamon bark which can be very harsh when breathed in vapor form. We have also used Eucalyptus Smithii which is a lighter form of Eucalyptus that is better suited when used around children. Finally we have added Thyme oil which is a very strong, refreshing and stimulating aroma that is also very good at destroying pathogens. Suggested Uses: As a general antimicrobial, anti-pathogen tonic. Ingredients: Cinnamon Bark, Eucalyptus, Lemon, Rosemary, and Clove organic essential oils. The Solum Nox Vitis diffuser comes with a natural, dark pine, cylindrical base and a hand-blown glass bottle. Unlike most other diffusers, the Solum Nox Vitis contains no plastic parts that would corrode when in contact with the oils. With proper care, your diffuser can last for many, many years. ArOmis diffusers use no heat or water to function, keeping the essential oil in its natural state as it becomes a mist. The automatic timer to cycles the on and off every ten minutes for one hour and then turns itself off. Safety Information - Use only 100% pure essential oil. Keep unit away from children and pets. Indications - Indoor use only. Cleaning: See Below under Use and Maintenance. The ArOmis Aromatherapy Diffuser is a very simple to use but it does require some care. Below are instructions on how to use and maintain your ArOmis Aromatherapy Diffuser. Please read these instructions BEFORE using your ArOmis Aromatherapy Diffuser. Remove all the components in the product box including the wood base, glass diffuser bottle, glass cap and power supply. Twisting back and forth, push the glass diffuser bottle into the rubber hole on the top of the wood base. Be careful not to twist the bottle in one direction as this could twist the inner air tube and choke off the air supply. Plug in your aroma diffuser into any 110v to 240 AC wall socket. Note that if the power plug on the wood base sometimes needs and extra push to plug in all the way. Carefully drop in between 10 and 25 drops of oil into the glass bottle. Be sure not to over-fill the bottle. If oil is filled past the top of the small glass tubes at the bottom of the bottle oil will leak into the air tube and down into the motor. Essential oil will destroy the internal motor. Turn the power knob clockwise one click to turn the unit on. Turning the knob clockwise increase the flow of vapor and counterclockwise to reduce the flow. The oil in your diffuser should last between 30 and 60min depending on the power level. The Diffuser is designed to last many years if properly maintained. Occasionally you should clean both the base and glass parts with rubbing alcohol to remove oil residue. the glass tubes. Rubbing alcohol will flow through the tubes and clean them. Feel free to hold the bottle with alcohol in it, in your hands, covering the top and bottom with your palms and shake to speed up the cleaning process. Use excess rubbing alcohol to swab the outside of the bottle and wood base to remove any residue. Do not use soap and water to clean your bottle as it will leave water marks inside your bottle that are very difficult to remove even with rubbing alcohol. Soak your bottle overnight if your diffuser seems to have reduced vapor output. Feel free to diffuse 5 to 10 drops of rubbing alcohol to clear out remaining oil if you plan to switch oils and don’t want them to mix or plan to leave the unit off for many days. Here is a detailed video on how the clean the diffuser. Is your unit turning on? When you plug the unit in and turn the power knob all the way to the right, you should hear a low hum from the base. If you do not hear any noise and sure that the power outlet you have the unit plugged into works, please skip to the section below called "motor repairs and warranty service" otherwise keep reading the next step. Check the quantity of oil. The ArOmis diffuser can diffuse up to 25 drops of oil per hour on full power and almost zero oil on low. If you add the recommended 15 drops to start, and put that on medium low, that should last for about 2 to 4 cycles of 10 min. However, new users often do not add enough oil to start and put the unit on high power and come back after 4 hours to smell no aroma. This is because the oil was used up 3 hours earlier. You will know if the oil is out if you hear the unit gurgling and spitting. You will find that if you add oil, that sounds stops and the aroma should start again. Thickness of the oil. Thick oils do not diffuse well. Adding thinner oils into thick ones will help dilute and thin the density of the oil. Everclear alcohol can also be used to dilute oils. Most oils work fine but do avoid blends that contain vegetable or nut oils like Jojoba, CFO (Coconut oil) or any cooking or message oils. They can thicken and clog the diffuser. Did you put your bottle in correctly? pushing the bottle into the base by twisting the bottle in one direction can cause the internal tube to spin around and choke off the air supply. It is somewhat difficult to brake it free as it is glued in place but we designed the unit to brake free before the tube would tare.To Check for air pressure in the base by removing the bottle and placing your thumb firmly over the air hole. With the power on full, see if air will push up under your thumb with about 10psi; about the same pressure that you can blow through a straw. It can be difficult to tell if this is the issue or if the motor is the concern as they will have the same symptom; no air pressure. It is possible for the use to open the bottom of the base to check for a twist but it is not always recommended unless returning the base is prohibitively expensive like for some international buyers. Returning the base to us is probably the best option for most users. If you do feel adventurous and comfortable taking things apart email us at staff at oasisadvancedwellness.com and we will send you a video on how to do this. Opening the base will not expire your warranty. Power supply. The power supply is the one part of the unit that we do not manufacture and we do our best to find the best power supplies on the market for our diffusers. However, if the units do brake, typically they do so almost right away after using them. Typically within the first 5 hrs of use. This is true for all electrical devices. You can actually test if your power supply is the problem by using a voltage meter or battery tester. If you happen to have one, or don't have one, you may want to get your self one as they are really handy for all sorts of things including testing batteries. The power supply will put out 12v DC so test for that using a tester and if you see no voltage you know the issue is the power supply, not the motor. If you do find a non-working power supply email us at staff at oasisadvancedwellness.com with your order ID and we will happily send you a new one. If you are outside the USA, we typically do charge for shipping especially if your unit is over 12 months old. Q. "There seems to be a little oil left at the bottom of the diffuser that won't diffuse. What should I do?" A. Normally if there is oil remaining at the bottom that is yellow or heavy, add some lavender. Lavender is incredibly light, blends with the other oils easily well and dilutes heavy oil enough to effectively vaporize. You can also just wash the bottle out with rubbing alcohol if you don't care to use it. Q. "What's your experience with water based diffusers, what's the difference?" A. A simple summary, water units are mostly humidifiers that produce water vapor. Our diffuser unit only diffuses oil. Our unit is made of wood and glass, and most water units are plastic. This is mainly a concern because essential oils and plastics tend to be poor bedfellows. Oils stick to and corrode plastics and plastics tend to "change" the nature of essential oil through chemical reaction. Functionally a lot of people like water units because they like the puff of water vapor and flashing lights. We are fundamentalists with regard to therapeutic use of oils and tend to just want oils, not water or lights. We think our unit is much prettier than the plastic ones and can be left in the main area of your house and look like a piece of art. The plastic ones seem to need to be hidden from sight. On a technical note, the water units, here is our experience so far. We have really mixed feelings about that technology. They are 99% just a humidifier. The water droplets carry some oil for sure and look quite prolific but again its all water vapor. People claim that they can disburse oils but actually in our experience most of the actual oils, especially the heavy and sticky parts that we in the "therapeutic world" are interested in end up stuck or floating on the side of the water reservoir walls and make a sticky mess. What gets released are the light esters, not the oil. It makes sense actually when you think about it in terms of oil "size". Oil gets disbursed as micro-droplets in the diffuser using direct air nebulization. Using simple common sense, what happens when you drop oil in water? It pools together into a big blob and floats away from pressure. This is what happens in the water units. The water/air droplets floating up off the ultrasonic transducer capture some oils that are located at the center of the water dish but most of the oil has already moved to the sides of the reservoir and are lost. So I see them as a inferior product for this reason. Functionally we also have found that most of the oil that is put into the water units gets stuck to the side of the reservoir bath and is not diffused. Especially the heavier parts (longer chain hydrocarbons and acids) of the oils. It is these longer chains often times that are the business end of the medicinal aspects of the oils. If these are not being released then the main point of the diffuser has been lost in my opinion. Q. "How do I clean the diffuser?" Q. "What is the guarantee and return policy for the diffuser?" Product Warranty - The manufacturer guarantees the manufacturing and craftsmanship of the diffuser for a period of 1 year from the time of purchase. However, the manufacturer may extend replacement and repair services beyond the 1 year warranty period. Returns - Product returns for full refund will be offered to any customer for any reason for a period of 30 days from the date of purchase. Returns for working units will be subject to a 10% cleaning and restocking fee and shipping costs will not be refunded. OAW reserves the right to refuse a full refund if the unit is received and deemed to have been damaged by the user. Products returned after the 30 day refund period will be repaired or replaced at the seller’s expense. A Return Authorization must be placed on the outside of the box along with the Invoice Proof of Purchase received at time of order. Please see the OAW Customer Service Page for more information.